When you’re off to swimming, you must be wondering that it’s just you and the water and there is no one else apart from that. But did you know that there is a fair amount of technology which you can arm yourself with in order to get the most out of your swimming session. Certainly, it is true that runners have access to a really wide variety of gadgets but that doesn’t mean that swimmers don’t have any. It needs no mention that swimming gear has to be waterproof and not just water-resistant. Though both may sound similar to each other but there is a difference. While water-resistant products will withstand being rained on or splashed, waterproof swim gear will even work when they are submerged in water. When you opt for swim gear, you would also want them to be comfortable. If your MP3 player or goggles cause you to hold your body in a specific way in order to feel comfortable, that would slow down your activity. Last, but not the least, the swim gear has to be streamlined so that it doesn’t drag you in water and cost you valuable seconds. 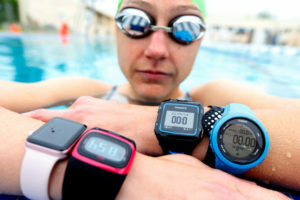 When it comes to swimming tracking, Garmin Swim is the number one in the field of three. The obvious rivals are Withings Activite and Speedo Shine which has got restrained speed tracking abilities besides its step-counting skills. Garmin Swim on the other hand, is a better proposition as compared to its rivals. It masks a wealth of tech which includes lap counting, strokes per length, distance covered and calories burned. It has also got the capability of telling the type of stroke that you’re doing by the way in which you move your arms. This is indeed impressive! Apart from having the longest name of any pair of swimming trunks, the Speedo Fastskin LZR Racer X Jammer is the quickest thing that you can wear while swimming. This is made in such a manner that it feels tighter than a worm’s belt but at the same time it has got enough stretch giving you lots of freedom to move. In fact, it is so tight that the company says that you may initially take around 10 minutes to get into it. Due to the super-tight fit, you can feel more streamlined in water and it also compresses your muscles thereby helping you recover faster. The color choices are also extremely vibrant. Don’t you think you will get bored while swimming for hours on your own? This is why you need this MP3 player. The Finis V2 utilizes bone conduction technology to play music utilizing tiny vibrations beside your cheek. You won’t have any earbuds plugging your lug hole and hence you will be free enough to hear the Jaws theme whenever the shark comes closer. This has got 4GB storage and can hold 1000 songs which are probably enough for you to swim across the English Channel! You will simply love the colours! They also have the kind of lenses which you would crave for. These goggles are available with 5 interchangeable nose bridges and a silicone strap and hence you can find the perfect fit. The shape of the lens helps with peripheral vision and hence you will get to know when someone else is coming to overtake you. Therefore, if you’re someone who has developed a hobby of swimming, you should definitely get yourself all or some of the swimming gears mentioned above.